Here are some pics I took on Cerro San Cristóbal (San Cristóbal Hill) is a hill in central-northern Santiago, Chile. 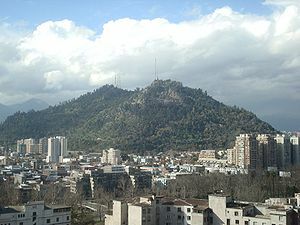 It rises 880 m AMSL and about 300 m above the rest of Santiago; the peak is the second highest point in the city, after Cerro Renca. Cerro San Cristóbal was named by the Spanish- Chilean San Cristóbal family, although its original name is Tupahue (mapudungun: “place of god or gods). The San Cristóbal family held a quarry on the hills south side, close to the Mapocho river. That is why it is called San Cristóbal even if it has a statue of Virgin Mary on the top. The limestone from the quarry was used in the building of the first contentions of the Mapocho river and also in its bridges. Statue of the Virgin Mary on the top of Cerro San Cristóbal.